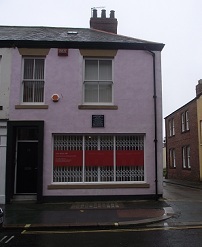 Birth: Friday, 2 December 1842 at 10 Norfolk Street [left], Bishop Wearmouth, Sunderland, county Durham [registered in Sunderland, December 1842 as Charles Alcock]. Attended Walter Todd Preparatory School, Woodford and Harrow School. According to the 1851 census, The second son of five, to parents Charles and Elizabeth Alcock. Still at school, living at 17 John Street, Sunderland. They have three servants. According to the 1861 census, he was an unmarried Ship Broker in his father's business, living in Sunny Side, Chingford in Essex. Still living with his parents. They have two servants. Marriage: to Eliza Caroline Ovenden on 19 December 1864 at St. Philip's Church, Arlington Square. [registered in Islington, December 1864]. According to the 1871 census, he lived at Grassendale House in Rosendale Road, Lambeth. He is recorded as Chas Wm, a journalist, husband of Eliza, and father of one son, William E.F. and two daughters, Elizabeth M. and Florence C. They have two servants. According to the 1881 census, Chas Wm. lived at 36 Somerleyton Road, Lambeth. He is a journalist and publisher. Still married now with three more daughters, Helen M., Marion F. and Violet May. They have two servants. According to the 1891 census, Charles W. was earning his trade as a Journalist and Author, living alongside his wife and four of his daughters, and three servants, at Heathlands, Kew Road, Richmond in London. According to the 1901 census, Charles was still a journalist and now a JP in Surrey. Living with his wife, three daughters, and two servants, at Hazelwood, 16 Ennerdale Road, Richmond in London. Death Tuesday, 26 February 1907 at 7 Arundel Road, Kemp Town, Brighton, Sussex, aged 64 years 86 days [registered in Brighton, March 1907]. "DEATH OF MR. C. W. ALCOCK―A FATHER OF MODERN FOOTBALL. "Mr. Charles William Alcock one of the fathers of modern football, died at Brighton yesterday. Of late years his name has been chiefly associated with cricket, because of the post of secretary to the Surrey County Cricket Club, which he had held since 1872. But football was his first love, and it was in connection with the development of the Association code that his name first became familiar out of London. He does not appear to have been present when the Football Association was formed in 1863. His brother was a member of the first Committee, but it was three years later that he became officially connected with it. Mr. Alcock did more than any other individual, however, to establish it firmly. He had been playing the game for some years, first at Harrow, where he was educated, and afterwards with the Epping Football Club, which he helped to found and to broaden into the famous Wanderers club. He was captain of the latter team when it won the Associtaion Cup in 1872, and he originated the idea of International matches by two years previous to that―organising a match between English players and a team of Scotsmen resident in London. In the first recognized International match, in , he was a player, so that his practical knowledge of the game was undoubted. "On the Football Association, then, he speedily became prominent. Early in 1870 he was appointed honorary secretary, and for sixteen or seventeen years he took the lion's share of the work. During this time there were great changes. "In 1884, Mr. Alcock moved a resolution at the annual meeting of the Football Association that professionalism be legalised. He had been brought to this by a knowledge of the veiled payments to players that, it is stated, were first made by the Darwen Club, the new system spreading through Lancashire rapidly. The proposal was rejected, but later in the same year payment of 'wages lost' was authorised. This was no remedy, and in July, 1885, largely owing to Mr. Alcock's exertions, the football professional was openly acknowledged. In 1886 Mr. Alcock was appointed paid secretary of the Association and he held the post until 1895 having then served for about a quarter of a century. During this time he had also been a prominent writer on the game, being engaged on the 'Sportsman' staff, and with journals devoted to athletic sports which he had helped to establish. "In recent years Mr. Alcock took up golf―the game to which cricketers who wish to keep in condition during the winter months are turning in ever-increasing numbers. He was on the Commission of the Peace for the county of Surrey. 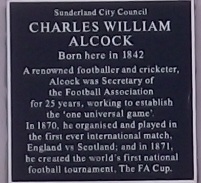 Mr. Alcock was born in Sunderland in 1842." - Wednesday, 27 February 1907, The Yorkshire Post. According to the 1911 census, Eliza, now a widow and living by private means, remains with two of her daughters, Florence and Marion and a single servant, at Hazelwood. "The funeral of the late Mr C. W. Alcock, secretary of the Surrey Couny Cricket Club since 1872, president of the Surrey County Football Association, and a vice-president of the Football Association, took place at Norwood Cemetery on Saturday morning. On Saturday a large gathering of famous cricketers, both old and new, representatives from various football and cricket clubs and associations, and a great array of magnificent wreaths, including tributes from the majority of the first-class counties, showed eloquently the esteem in which he who had worked so long and so hard in the cause of sport was held by all who came in contact with him, whether professional or amateur, exalted official or humble workman. "The funeral service was arranged for one o'clock, but long before that hour a little crowd of mourners was assembled at the cemetery gate. When the cortege arrived and proceeded up the long, sloping path to the little chapel at the top of the hill, a procession fully a hundred yards in length followed. The spring sun shone brightly, and a little band of red-coated soldiers, sent to represent the Guards Depot F.C., introduced a splash of colour among the prevailing hues of sombre mourning. "The coffin―which was of plain oak and bore the simple instruction: ;Charles William Alcock. Died 26th February 1907. Aged 64 years. "―was covered with floral tributes, to the number of well over fifty. The funeral service was most impressively read by Dr John Darlington, Vicar of St. Mark's, Kennington." - Monday, 4 March 1907, The Sporting Life. Biographies The Father of Modern Sport: The Life and Times of Charles W. Alcock - Keith Booth. (Parrs Wood Press. 2002). Club(s): Educated at Harrow School, Alcock was a keen schoolboy footballer, and formed the Forest club from Epping with his elder brother, John, in 1859. He was then a prime mover in the 1863 foundation of Forest's more famous successor, Wanderers FC, who were initially a predominantly Old Harrovian side. Appears to have been a member of Upton Park FC between 1869 and 1872. Also a first class cricketer with Middlesex and Essex. Then became secretary of Surrey, the Cricket Club that owned the cricket ground in Kennington, London. Douglas Lammings' An English Football Internationalist Who's Who  & Keith Booth's The Father of Modern Sport . Player number One of six who became the 28th players (31) to appear for England. Individual honours England's joint-Top Goalscorer (one 1875) and the fourth player to score on his debut. Distinctions One of the many committee members that founded the International Match (Alcock himself, never took the credit), and headed the selection process for England's first 31 matches, 1872-1887. "After another second place in the Home Championship behind the Scots 1886/87, England finally triumphed in the 1887/88 season. The season had begun with the introduction of the FA's new International Selection Committee and finished with outright victory in the Home Championship for the first time. The old selection procedure had got out of hand as upwards of 70 players would turn up for the trials, making the process a logistical and bureaucratic nightmare for Alcock and his team..." Forever England: A History of the National Side, Mark Shaoul & Tony Williamson, 2000, page 19./First Elevens: The Birth of International Football, Andy Mitchell, 2012, page 16. England's oldest goalscorer from March 1875 until March 1896. A sports journalist by profession, compiled the first Football Annual (1868) and edited the Cricket newspaper 1882-1905. He had a close connection with the summer game having played for Essex and crack club sides, and serving as secretary of Surrey CCC 1872 to his death. Was also chairman of the Richmond Athletic Association and vice-president of the Mid-Surrey Golf Club. - An English Football Internationalists' Who's Who. Douglas Lamming (1990). Hatton Press, p.9.